We are in a period of time where buy-and-hold returns from traditional asset classes are predicted to be very low in real terms. This is simply a matter of valuation. Equities and fixed income markets aren’t generating very much excitement, leaving the average investor with unattractive return forecasts if they are using traditional, passive strategies. The U.S. equity markets have demonstrated a reasonably consistent history of moving through 40 year cycles that operate in very similar ways. The first 25 years of the cycle begins with technological innovation. This creates an economic engine, a rocket booster, driving secular bull markets which create incredible wealth. Those who are able to capitalize on this revolution, such as those who were at the forefront of microprocessors and personal computing in the 1970s and early 1980s, tend to be the primary – and most significant – beneficiaries of this wealth creation. Prosperity, unfortunately, doesn’t happen equally for everyone. In many cases, it can be disruptive. As those who are able to capitalize on the revolution are only a small portion of the population, the result is a large wealth inequality gap. The “Occupy Wall Street” movement of 2011 demonstrates exactly how wide that gap became. When the gap grows wide enough, politicians arrive with greater taxation and regulation, promising that these structures will close it. These restrictions discourage innovation, hampering growth and leading to a stock market that churns sideways for an average of 15 years. If this 40-year cycle holds true to form today, we estimate that we are about halfway through our own 15-year sideways period. 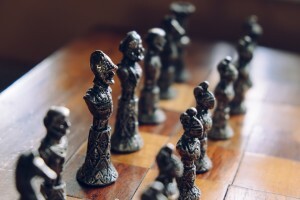 It will be important during the next decade to manage strategically, like a chess player who has already planned out the next 5 moves while placing their first pawn on the board. Calm heads will prevail in times of panic, and will keep investors from making terrible mistakes. The reality is that most people do not have the temperament required to navigate a market that is as tough as we expect this one to be for some time. The days of low volatility and markets moving higher and higher on a passive basis are behind us. How will investors make money moving forward? Looking for sources of return that differ from the traditional, and moving against the herd. This doesn’t mean that the return can’t come from stocks, but it may mean treating them differently than we did over the past 15 to 20 years.